A celebration of all things nomad. An analogue to the Olympics or FIFA World Cup. The greatest P.R. exercise in the history of Central Asia. The World Nomad Games in Kyrgyzstan was the object of much attention and even more fanciful descriptions in the weeks leading up to the opening ceremony of the event on September 9th in the beach resort town of Cholpon-Ata, but from the moment traditionally dressed dancers took the stage and the Kyrgyz delegation marched into the Hippodrome stadium with President Almazbek Atambayev at the head it was clear that the week would be one full of color and excitement and more than a bit of national pride. For a competition billed as ‘an absolutely new format of tournament for ethnic sports’ the presence of teams from countries like Afghanistan, Mongolia, and Turkey was no surprise. Less expected were delegations from Brazil, South Africa, and the United States – though admittedly these were much smaller. For many of the World Nomad Games sports competitions, spectators would have never even needed to stray from the Hippodrome Stadium. 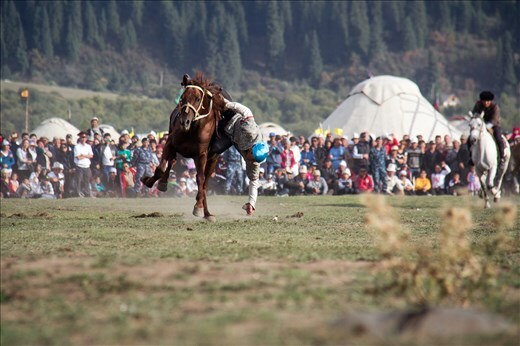 Befitting the mountain lifestyle of the traditional Kyrgyz nomad, almost half the games in the tournament involve horses in some fashion. The Alaman Baige horse races, pictured here, pitted over twenty young riders against one another in a long distance race around the oval track surrounding the Hippodrome’s central field. 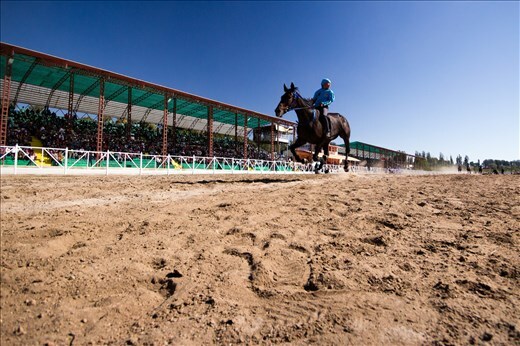 Kyrgyz riders took both first and third place, though not without some controversy: the delegation from Kazakhstan adamantly argued that their second-placed rider actually crossed the finish line before the winner. The first race of the day, a trotting competition known as Jorgo Salysh, was a lot more clear-cut as the Kyrgyz teams took all three top spots. With mountains to the north and Issyk Kol lake to the south, even the quiet moments between races were a sight to behold. Internationally, Kok Boru is probably the most well-known of all the sports featured in the World Nomad Games. Though the Afghan name Buzkashi is much more common in the west (largely because of the popularity of the 2012 documentary film Buzkashi Boys), Kokpar and Kok Boru and Ulak Tartysh all refer to the same thing: two teams of horsemen galloping across an open field attempting to hurl the 45kg+ carcass of a headless goat into a large concrete cauldron. A game of Kok Boru tends to alternate between long periods of strategic posturing as one player from each team circles off to gain control of the goat, and then bursts of excitement as a rider grabs the goat and attempts to score before other riders can catch him. Not at all uncommon, however, is a stoppage of play when a rider has been thrown from his horse or because the pack has simply plowed straight into the crowds on the sidelines. Official estimates from the Kyrgyz Ministry of Tourism put over 45,000 people at the weeklong event, with over 15,000 of those attempting to attend the opening ceremony in a stadium intended to seat less than half that number. Around 90% of spectators were from Kyrgyzstan itself, and the traditional Kyrgyz Kalpak hat was so ubiquitous that this number is easy to believe. In this photo, spectators sit on the front row waiting for a match of Kazakh Wrestling to start at the Rukh Ordo Cultural Complex. Part of the appeal for attendees was a government mandate that events for the World Nomad Games be free of admission for all. 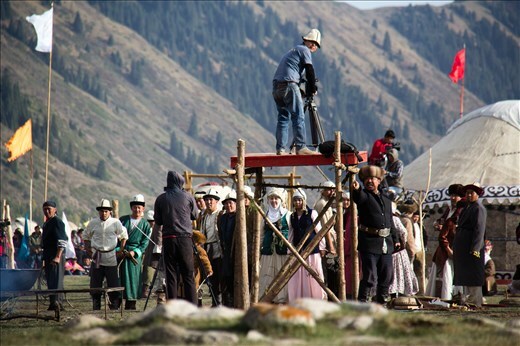 This extended not only to sport events, but also to fashion shows at Ruhk Ordo (a venue for which admission is normally charged) and screenings of the newly released film Kurmanjan Datka, based on the life of a legendary female chief from the south of Kyrgyzstan who came to power in the late 18th century. In preparation for the World Nomad Games, over 150 yurt tents were assembled in the Semenovka National Park an hour to the east of Cholpon-Ata. 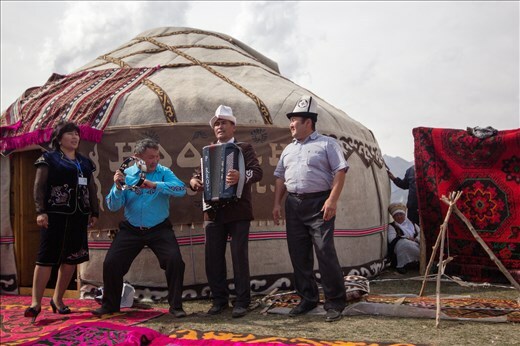 This Ethno Village was created primarily to showcase Kyrgyz traditions, food, and culture. Fermented horse milk (kumyz) and boiled horsemeat with noodles (besh barmak), both staples of the nomad’s diet, were served throughout the camp. Life in the mountains is an essential part of the ongoing existence of nomads in Kyrgyzstan, with herders moving each summer to the jailoo (mountain pastures) where they can graze their flocks of sheep, cattle, and horses for the warmer months. While the Ethno Village at Semenovka only existed for a few days, the organizers did manage to pack in cooking competitions that offered a taste to all and enough song and dance that the entire jailoo was full of music. Each camp, hosted individually by each of the seven regions of the country, also demonstrated national traditions such as the “yurt raising ceremony” and the “ceremony of the arrival of the bride to the new house”. 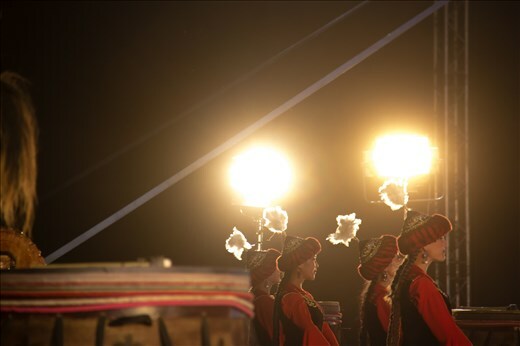 The largest production on the jailoo was the theatrical performance of “The Show of Nomads”. Introduced by Vice Prime Minister Elvira Sarieva, the actors in traditional Kyrgyz costume presented over an hour of history and legend and music and more. Surrounded by mountains on all sides and narrated exclusively in the Kyrgyz language, one might be excused for thinking that time had somehow wound back to the era of local legends like Kurmanjan Datka or epic hero Manas. The only thing to break the show’s spell was the camera for Kyrgyz national television that broadcast the event around the world. The World Nomad Games were covered by media representatives not only from Central Asia, but from as far away as the US, UK, Russia, Sweden, and Turkey. 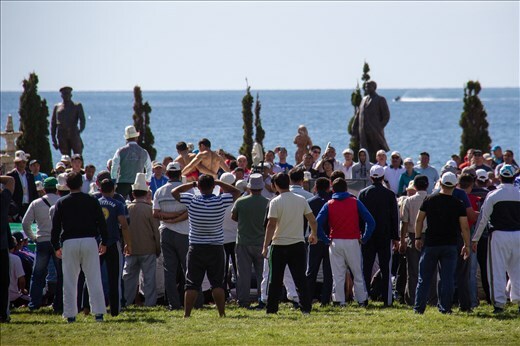 Particularly popular with the assembled crowd were demonstrations of national games like Salbuurun (eagle hunting) and Tyin Enmei. In the first, trained eagles are released to capture prey like doves, rabbits, and even wolves. While the presence of a huge audience at Semenovka necessitated that captive prey be used in these exhibitions, under normal circumstances these birds have enough training to go out on their own and find prey from the wild. Tyin Enmei, pictured here, challenges riders to collect a single coin from the field while mounted on the back of a galloping horse. Both events require great skill and quite a lot of practice, but the performers at Semenovka were nearly flawless in execution. Though put on as cultural displays rather than within the sporting competitions of the World Nomad Games, events like these and At Chabysh (horse racing) still seemed to fire up quite a competitive spirit. The official competitive horse racing, meanwhile, wrapped up on the final day of the World Nomad Games with Kynan Chabysh. A race for horses of any breed up to three years old, the event saw both first and second place awarded to competitors from Kazakhstan. The first place rider, competing on his birthday, no doubt had quite a lot to celebrate! 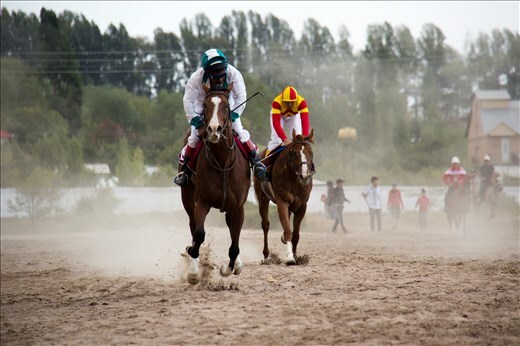 While all three of the horse racing events (Alaman Baige , Jorgo Salysh, and Kynan Chabysh) were fairly similar, they were distinguished by distance, speed, and the age of both horse and rider. 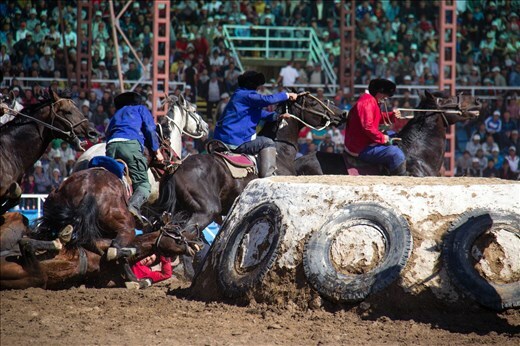 These competitions are held fairly often in Kyrgyzstan and Central Asia more broadly, where horse riding is such an integral part of the traditional culture. The other main World Nomad Games venue for sporting events, the Rukh Ordo Cultural Complex, also hosted ongoing competitions throughout the tournament. 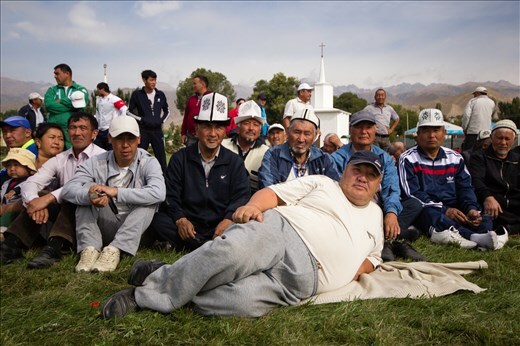 Pictured here, spectators gather around a preliminary match of Kyrgyz Kyrosh. The three Wrestling styles in the tournament (Kyrgyz Wrestling, Kazakh Wrestling, and Belt Wrestling) drew the most international competitors and not coincidentally saw the most medals awarded to foreign athletes. In addition to Kyrgyzstan and Kazakhstan, who dominated throughout the Nomad Games, other countries to win medals in wrestling competitions across the various styles and weight classes included Turkmenistan and Tajikistan (both of which won gold medals) as well as Mongolia, Russia, and Uzbekistan (one silver for Mongolia, and numerous bronze medals for all three nations). With strong wrestling cultures in all of these states, it should come as no surprise that these events were quite competitive. While Alysh (Belt Wrestling) stipulates that the athletes must keep their hands on each others’ belts at all times, Kyrgyz Kyrosh and Kazakh Kyrosh (the latter pictured here) are more freestyle. Kazakh wrestlers have a long history of dominating wrestling competitions, and regularly place in events around the world. Their training program has attracted international athletes since Soviet times, and to this day Russian wrestlers still go to Kazakhstan to develop their skills. These sports also seem to be a crowd favorite, with visitors lining up each morning outside the Rukh Ordo venue to be the first to enter and take a prime seat on the ground just beside the wrestling mats. While the majority of the sporting events at the World Nomad Games showcased physical strength, two lesser-known competitions focused on mental prowess. Toguz Korgool (literally ‘nine stones’ or ‘nine sheep droppings’) forces players to make quick calculations to determine the optimal strategy to take opponents’ game pieces. Distributing the contents of one hole into each consecutive space on the board, a player whose turn ends with the last stone landing on the oppositions’ side into a hole with an even number of pieces collects all of those pieces into their own treasury. The player with the most stones in his or her treasury at the end of the game is the winner. A number of Western sportsmen from France, Germany, and the United States competed in this event and while none won medals the American team did place fifth overall. As with many of the World Nomad Games sports, the Kazakh and Kyrgyz teams dominated Toguz Korgool. Pictured here, two Kyrgyz competitors face off while a referee observes. Players of the game of Ordo (meaning ‘center’) use a tompoy (horse knuckle bone) to knock thirty small alchik (goat or sheep knuckles) out of a chalked circle that serves as the field of play. Ordo is commonly seen throughout rural areas of Kyrgyzstan, and an abbreviated version can usually be found on Bishkek’s central square on major holidays. While Kyrgyz teams won first and second place in Ordo, third went to Tajikistan. The location of the matches, on a small bit of elevated land in the rear of the Rukh Ordo complex that extended out into Issyk-Kol Lake, was perhaps the most beautiful sites of any of the competitions held under the aegis of the World Nomad Games. 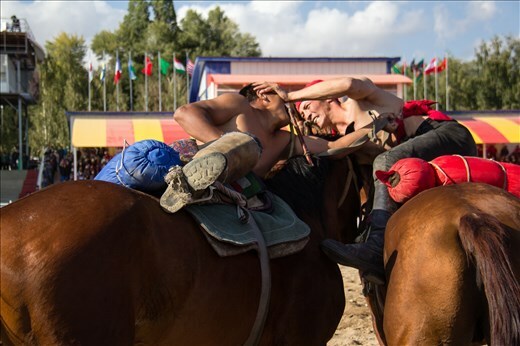 For foreign tourists and journalists watching the World Nomad Games, one of the biggest surprises was Er Enish (Horse Wrestling). Riders put on an amazing display of both strength and horsemanship as they faced off and attempt to drag their opponents from horseback to the ground. At times even the horses themselves seemed to pick up the spirit of the fight, rearing and biting every bit as aggressively as the riders themselves were grappling. One of the most entertaining teams, the delegation from Afghanistan, was also the center of a major controversy during the final rounds of Horse Wrestling. After a referee whipped (whether intentionally or accidently was impossible to verify) one of the top Afghan wrestlers during an attempt to break up a match that had left the boundaries of the playing area, the entire Afghan team stormed off the field and out of the Hippodrome. The Kyrgyz went on to win gold and silver in both weight classes, while the Kazakh teams earned two bronze medals. Even after the Games were over, there was still one more major event to finish off the First-Ever World Nomad Games. The Closing Ceremony featured artists from Turkey, the United States, Kazakhstan, and of course Kyrgyzstan. With R&B, Electronica, Folk Music, and quite a lot of Kyrgyz flags the tournament ended just as impressively as it opened. Though it is not yet clear whether the World Nomad Games will actually become an annual event (and who would host the next iteration of the tournament, were it to be held next year), the fact that the idea was developed as a collaboration between the governments of Turkey, Kazakhstan, and Kyrgyzstan points to one of these three continuing the tradition. 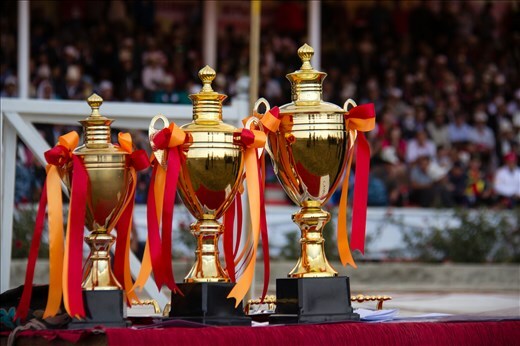 Overall the teams from Kyrgyzstan dominated the World Nomad Games, winning 55 of the 109 medals awarded in total. As host nation the Kyrgyz were allowed to enter two teams in each competition, which accounts for some of their dominance. There was also mutterings between other competitors that though Kyrgyzstan provided horses for most of the countries competing in equestrian events they gave first choice to the Kyrgyz teams and only allowed other sides to choose from the mounts that were left. Among the rest of nations competing the Kazakhs won the most medals (28), with the other countries all far behind: Turkmenistan (6), Tajikistan (4), Mongolia (7), Russia (5), and Uzbekistan (4). Along with medals, cash prizes were awarded for the top teams in each event. 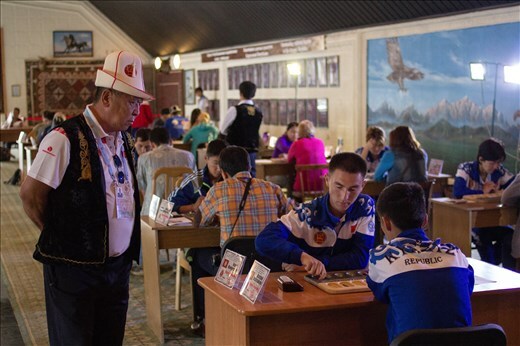 The largest, for Kok Boru, amounted to three million Kyrgyz Som (over $55,000 USD) and one million Som (over $18,000) for the first and second place teams [both from Kyrgyzstan] and half a million Som (over $9,000) to the third place team from Russia’s Altai region. Stephen Lioy is a photographer and travel writer from Louisiana who is currently based in the Central Asian city of Bishkek, Kyrgyzstan. In between exploring the mountains of the country or trying to track down snow leopards, Stephen is also the Editor in Chief of a small regional magazine in Bishkek. To see more photos and updates from Central Asia and beyond follow him on Instagram, Facebook, Google+ or Twitter.